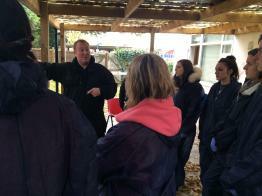 On 30th October students studying Crime and Investigative Studies at University Centre Peterborough (UCP) underwent an excavation of animal remains on the centre grounds. The excavation was the first of its type to ever be offered to degree level students and presented a great opportunity for UCP. Expert in CSI and experienced professional, Gareth Dineen, led the excavation which was designed to emulate the occurrence of a genuine crime scene. Gareth has had a 20-year professional career working with and training the police force but has never worked with degree students and believed it had a lot to offer. ‘The disciplines embedded in this workshop are transferable skills, enabling learners to make a more informed choice for their education and career pathway in subjects other than just Forensic Science. Students were engaged with Work Based Learning activities which put their skill sets to the test. They were unearthing pig remains, sieving for evidence and investigating the plot of land for additional information about the ‘crime’. Crime studies tutor Leisa Nichols-Drew organised the event for the students and aims to bring in other extracurricular activities for degree level students. 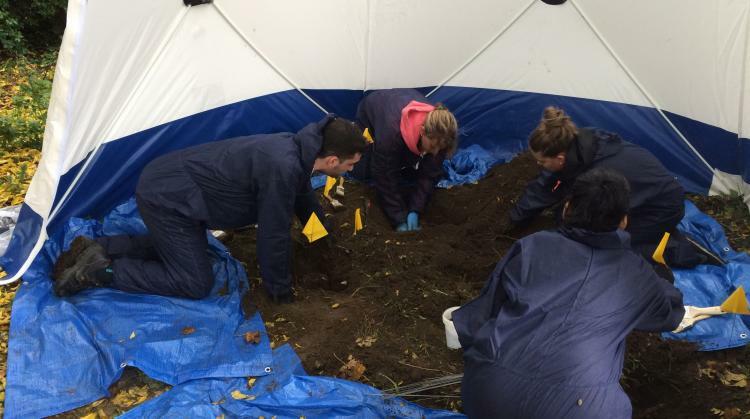 ‘This event gave students an unbelievable opportunity to engage with forensics experts, the activities that they carried out will be incredibly beneficial moving forward. This event is followed by a variety of further opportunities for students at UCP. Learners will have the chance to visit the Scotland Yard museum after it recently became available to the public and UCP are also offering talks from various guest lecturers. This includes a Jack the Ripper talk from DNA researcher, Dr Jari Louhelainen, who claims to have ground breaking new evidence from the 19th Century case. If you would like any more information about the opportunities at University Centre Peterborough or information about studying on the Crime and Investigative Studies degree then please contact us by telephone: 01223 69 5750 or by email: ucpenquiries@anglia.ac.uk.